Now here’s a great way to enjoy some limoncello after dinner. 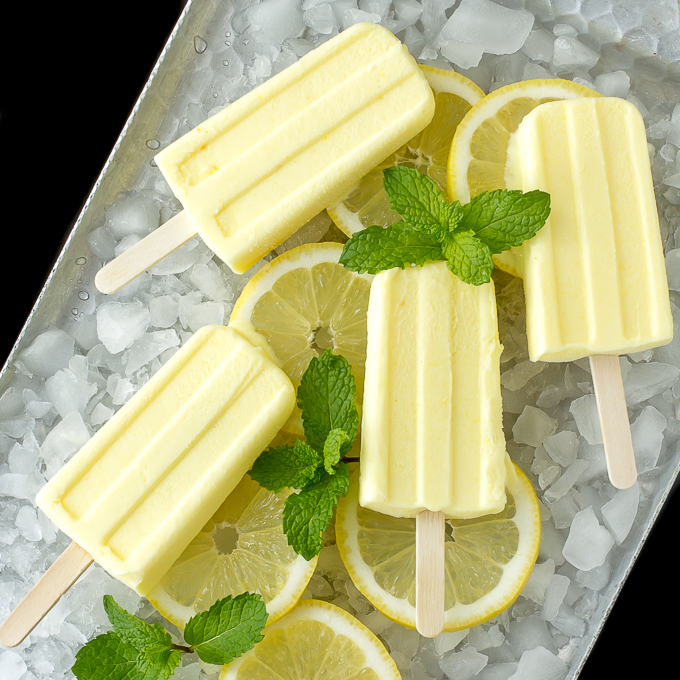 Or, don’t wait for dinner to be over, enjoy these Limoncello Pudding Popsicles any time you want a delicious treat. They’re so yummy, creamy and lemony! Instead of an icy popsicle, these Limoncello Pudding Popsicles are creamy, like a fudgsicle. They’re made with lemon instant pudding mix, milk, cream and limoncello. I chose to use cream to replace some of the milk to make them extra creamy, but if you want to cut back on the fat calories go ahead and use milk, they’ll be just as delicious. And remember, when you add alcohol to frozen desserts they don’t freeze as hard so you have to be careful not to add too much alcohol. The first time I made these I used 1/2 cup of my homemade Limoncello, and they were a bit soft, second time around I reduced the amount to 1/3 cup. I also thought they needed a bit more zing so the second batch I added some lemon zest and a 1/2 tsp. lemon extract. They were oh so yummy! You may wonder why I didn’t just use the juice from that zested lemon instead of lemon extract and I don’t know why. It’s just what I did. If you try it with the juice, let me know how it tastes! I’m loving these Limoncello Pudding Popsicles for summer and I can’t wait to try some other cocktail flavors. What’s your favorite popsicle flavor? Combine pudding mix, milk and cream in bowl and whisk for 2 minutes for instant pudding. If you're using pudding mix that needs to be cooked, cook it according to the package directions. Add limoncello, lemon zest and lemon extract and whisk to combine. Pour pudding mixture into popsicle molds and freeze until frozen. Yum! I love limoncello and popsicles. I think you are speaking my language! Thanks. It makes a great combination! What a refreshing treat for the summer. I love limoncello and now I have something else to add it to. You’ve outdone yourself on this recipe my friend. These look amazing! I wonder how they’d taste with almond milk? Beautiful pictures too! Limoncello! Seriously can’t get enough of it. Will definitely have to try these soon! Yum! I may try this with coconut or almond milk and see how it turns out. Fingers crossed! I am so making these this summer for the adults! Love this treat idea. I think my husband, myself, and our next door neighbors will be enjoying a number of these this summer! This sounds amazing and a definite must try! These poptails look refreshing & delicious! !